Rosy Outlook: Teddy Bear Vibes + FF Link-Up! Happy Wednesday and Happy New Year loves! Hope you had a great NYE/NY and are as excited as I am to start a new chapter and a new year. 2017 was such a great year for me personally and for the blog and I feel so lucky to have y'all as wonderful supporters! I definitely have a lot more in store for the blog this year and also hopefully expanding my YouTube channel. As far as our NYE plans, if you guys have been following me on Instagram you probably saw that the husband came down with the flu last Tuesday so our week was kind of awful. He tested negative for the flu at the walk-in clinic but his fever was SO bad and he had all of the symptoms. He also STILL isn't totally back to normal so because of that we just spent our NYE at the house with take-out and a movie! Did you guys do anything fun?! I have been wanting a teddy coat for the last 2 years but I put off buying one because I kept thinking to myself, "Will I actually wear it?" It seemed like a trend that would die and I would be glad that I didn't purchase it but after 2 years of wanting one, I finally pulled the trigger and I'm so glad this is the one I bought! It's the COZIEST coat ever and I love the length, fit, color, material, everything. If you've been thinking about buying one I would say go for it because I'm surprised how much I've worn mine already! Soooo CUTE and too funny, I have a vest in that material that I have coming up on the blog in a couple weeks and I titled it Teddy bear something, lol. They do feel so cuddly like a bear and you are darling! So sorry your hubby is feeling bad, I hope he's back to feeling good soon! I also hope you don't get it! But on a positive, I love the teddy coat! I love this cute cozy look! Im obsessed with that fuzzy coat! I need it!! You look great in this teddy bear coat! And I'm so sorry about your husband getting sick. Strange that he was negative for the flu! It's been rampant this year from what I hear. Hope he gets well soon! Gorgeous look and fabulous coat! Happy New Year, gorgeous! I hope this year brings you much happiness, great health, and success! As for this outfit, I absolutely love it! The sweater is so cute, I love the 70s vibes of it with the bold strips and it look so cute layered under the Teddy Coat. I'm glad you finally decided to get one, it looks so cute on you! I want to get one myself. Thanks for sharing and I hope you're having the best day so far! I'm so sorry your husband was sick over the holiday! I hope he starts to feel better soon. There is nothing worse than being sick when it's so terribly cold outside, too! I've been wanting a teddy bear coat for awhile now too. This one is so cute! Happy New Year, Kelly! LOVING the coat!! Perfect for this freezing weather we've had lately! 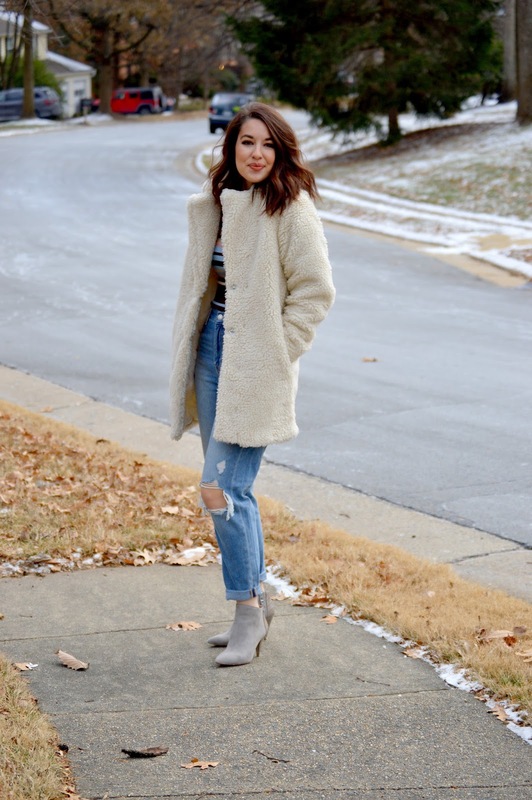 All about the teddy bear coat! I've been wanting one too and am waiting to get it in the mail! I love your high waisted jeans too! Perfect! Hope you hubby is feeling better! This outfit is so comfy and adorable, love it! Need a teddy bear coat in my life! You look so chic and snuggly! I love your jeans and that jacket looks so cozy - teddy bear vibes indeed. This jacket looks so incredibly soft and cozy! What a perfect closet staple for this time of year since it has been so cold! 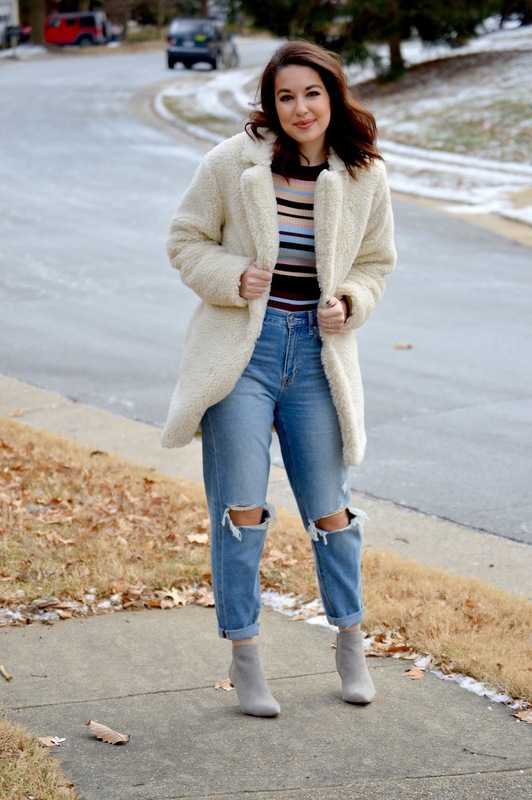 super cute winter style! love that stripe shirt tucked in, so darling! Love how cozy this look is. And thanks for the feature this week! Love the coat! Perfect with your jeans and how you styled it. I'm really loving this teddy bear coat trend right now. They're so comfy and warm, and yours is really lovely dear. 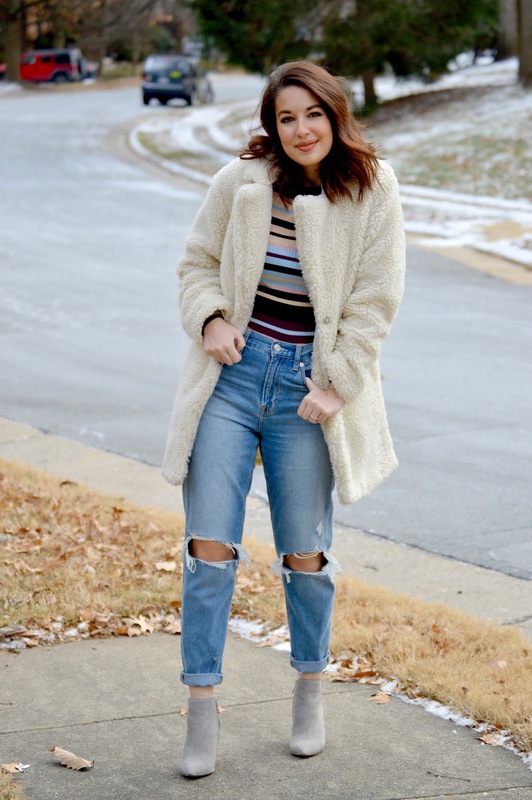 You're rocking it with stripe top and distressed denim.